In Brazil, the feast of Corpus Christi is a holiday. So we have a long weekend from the Thursday to the Sunday, 22 to 25 May. The buses coming from far away arrive very early. The group from Chapecó, in the State of Catarina, has travelled for 48 hours! They bring with them the icon of friendship that has been moving from place to place throughout their diocese following the October 2007 meeting in Cochabamba, Bolivia, which they took part in. All the young people are housed in families. On the Thursday evening, the buses arrive in front of the sports hall, bringing the young people from different neighbourhoods for the opening of the meeting and the evening prayer. On the Friday and Saturday mornings, in the parishes where they are staying, the young people set off after morning prayer to make visits, to see places where people are suffering and to discover places that are signs of hope. The exchanges that follow these visits show what a deep impression they have made. Before the prayer at the beginning of the afternoon, and again at the end, after the theme workshops, various cultural items are proposed. The most beautiful is the presentation of the capoeira group, a traditional form of wrestling where one never touches the other, yet with rapid movements one approaches the other very closely. For the theme workshops, a choice of eleven topics is offered: knowing yourself, prayer, young adults and the church, young people and politics, dialogue between religions, safeguarding our planet, etc. The day comes to an end with a full evening prayer. It is striking to observe the ease with which the young people pass from the hectic noise of some of the musical presentations to an inner silence. On Sunday morning, a two hour march through the city precedes the celebration of the Eucharist, which is both calm and joyful, with around five thousand people taking part. As they leave, everyone is filled with that special kind of joy that is nourished by prayer, hospitality and fraternal communion. 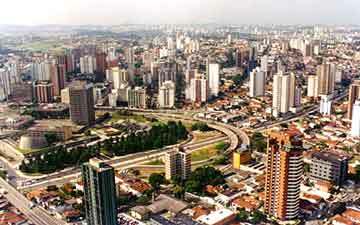 Chapecó is a medium sized city in the south west of the State of Santa Caterina, in the south of Brazil. The diocese is on the frontier with Argentina. In the 19th century, the region experienced important German and Italian immigration. You could see this during the meeting. Daniel, a young Brazilian who helped with the preparation of the meeting in Milan last year, commented: you would think we were in Europe; there’s not too many non-whites around! One thousand five hundred and forty young adults paid the small contribution to take part in the four days of the meeting, included among them were several Indians who normally would stay on the periphery of such events. Everybody stayed with families from fifty one communities of the Church of Chapecó, and everybody was full of praise for the kindness of the welcome they received. On the last day, Sunday, an extra three thousand young people joined the others to march four kilometers to the final celebration. Of all the “jornadas” held in Brazil until now, this was the one that received the greatest support from the local church. When the preparation team arrived at the end of June, a program had been set up for visiting the 40 parishes of the diocese, with their 1500 communities! Till the beginning of October, the youth volunteers travelled all over the diocese in two teams, staying three or four days in each parish. During the period of preparation, some of them stayed at the homes of up to 20 families! During the meeting, the young people spent the mornings in the neighbourhoods where they were staying. They began with Morning Prayer, then they made visits to people living in difficult situations: the sick, the elderly, people living alone; a home for drug addicts; an Indian community, etc. Through the direct contact they offered, these visits always left a strong impression. The noon meal was in the families, then everyone set off for a large school run by the Marist Brothers. 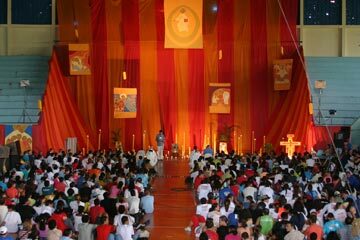 The afternoon began with prayer in the main sports hall, decorated with orange and red TNT (a very inexpensive cloth imitation made of plastic). In the middle of the decoration, there was an Indian hut and a shack from a slum, both made of plastic. In the first, the icon of the Trinity and in the second, the Virgin and Child. There is a choir of twenty people led by Rachelle, a young Canadian woman who took part in the preparation team. Carlos, from the city of Santo André which hosted the Jornada last year, plays the guitar together with Marcos, a Bolivian from the city of El Alto where a Jornada was held in 2004. “Cantarei ao Senhor”; “Deus é amor”; “Cantem céu e terra” et “Bendizei ao Senhor” are among the songs sung with the greatest enthusiasm. Then the young people split up into ten themes on the inner life, the Bible, the Church, and different aspects of social, economic and political life. In spite of the election campaign, with few exceptions these themes avoided people taking partisan stands. At the end of the afternoon, everybody came together in the courtyard of the school for a snack served with much kindness by adults; among the items offered, many kinds of fruit ripe at this time of year: mandarins, bananas, apples. Next, in the sports hall, came presentations: a group of deaf people, a group of blind, a group of Indians, a group presenting very beautiful traditional dances from the local gaucho culture, different music groups, and individual contributions. The music is loud and sometimes the assembly accompanies it with rhythmic movements or dance steps. Then everyone turns round towards the liturgical decoration. Candles in clay jars are lit. The choir starts to sing, and by the end of the first song, the entire assembly is “centred” for the evening prayer. Some people expressed their astonishment at seeing the young people remaining like that for more than a whole hour! They would not have believed it possible. On Friday evening there is the prayer around the Cross. 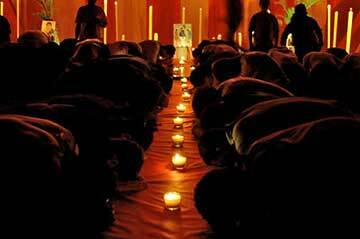 Everybody joins in; some approach on their knees. This is a gesture of the body that speaks strongly to the young people. And the day ends with going back to the families. During the last quarter of the 20th century, Chapecó had a remarkable bishop, José Gomes. He understood how to give confidence to the small farmers, to the farmers’ wives, to the Indian peoples of the diocese, and to the young, so that they organize themselves with a view to defending their legitimate interests, both in society and in the Church. His successor is continuing in the same way. The result is a strong sense of responsibility that can be felt in Church meetings. The accent on social and political struggle is very strong. 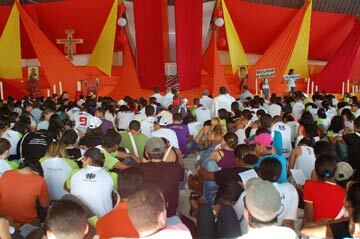 In a situation like this the times of prayer during the Jornada made a very strong impression. This was something new, and it responded to a deep thirst. It is with that light that shines in my heart and does good to my whole being that I write this letter to you. Christ made himself present among us. The times of prayer together, the small groups, the topics and the life that were shared with people from different places; these were the richest moments of the Jornada da confiaça, at Santo Andre, from 12 to 15 November. My spiritual life, and that of many, many others was nourished by the fraternal life during the meeting. These words were written by Renato, a young man from Campinas. The long period of preparation was sometimes laborious, partly because the local church did not have a very clear idea of what was being prepared, and partly because of the urban context in which the meeting took place: in the very large city, young people are constantly faced with a thousand possibilities, which can also become frustrating impossibilities. 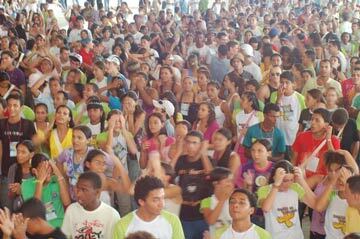 The Bishop of Santo Andre took part in the prayers, and was visibly touched by the fervour of the young people. The feeling of deep reverence continued through the prayer around the Cross, which lasted two hours, in spite of long queues to get close. The presence of an Orthodox priest and monk, and of several pastors, gave a visible ecumenical note. The singing was led by a very good choir, under the direction of a young woman from Chile who had come especially for the meeting. Most of the singers were from Campinas, where the choir has been in existence since the jornada that took place there in 2002. They are very familiar with the songs from Taizé.